(Ottawa, Ont.) 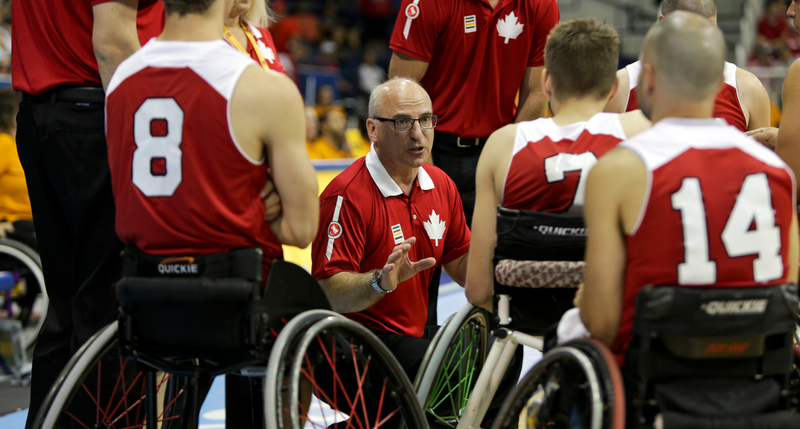 Wheelchair Basketball Canada is pleased to appoint Stephen Bialowas as the head coach of the Canadian Senior Men’s National Wheelchair Basketball Team. He takes over head coaching duties on a full-time basis after being appointed to an interim role in the spring of 2015. Bialowas, a resident of Richmond Hill, Ont., will be at the helm as Team Canada prepares to defend its gold medal at the Rio 2016 Paralympic Summer Games. Bialowas recently led the Canadian men to a 5-1 record and a silver medal performance on home soil as the team secured a Paralympic berth at the Toronto 2015 Parapan American Games in August. Bialowas previously coached the Canadian Men’s U23 National Team, and was behind the bench at two junior world championships in 2005 and 2013. He began coaching in Canada’s high performance program in 2001. As an assistant that year he helped the Canadian Men’s U23 National Team to their second consecutive gold medal. Also as an assistant, he helped coach the Canadian Senior Women’s National Team to a world championship title in 2002, and a bronze medal at the Paralympic Games in 2004. The Senior Men’s National Team is the defending Paralympic champion and has reached the podium at four consecutive Paralympic Games, winning gold medals in 2000, 2004 and 2012, and a silver medal in 2008. The team has also medalled at six of the past eight world championships.